304 stainless steel with an electropolish finish represents the highest industry standard in the prevention of corrosion. This finish is highly effective for corrosive, high humidity or cleanroom environments. 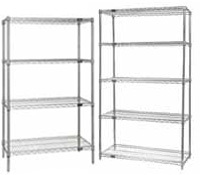 54" height stainless steel wire shelving unit. Consists of 4 posts and your choice of 4 tier or 5 tier shelf configurations. 63" height stainless steel wire shelving unit. Consists of 4 posts and your choice of 4 tier or 5 tier shelf configurations. 74" height stainless steel wire shelving unit. Consists of 4 posts and your choice of 4 or 5 shelves. 86" height stainless steel wire starter unit. Consists of 4 posts and your choice of 4 or 5 shelves.